This page explains how to resize both zonal persistent boot disks and secondary (non-boot) zonal persistent disks. The page also explains how to add and format new zonal persistent disks on your instances. You can only resize a zonal persistent disk to increase its size. You cannot reduce the size of a zonal persistent disk. Zonal persistent disks are available as either standard hard disk drives (HDD) or solid-state drives (SSD). For more general information about zonal persistent disks and the types of persistent disks that are available, read the persistent disks overview. Compute Engine manages the hardware behind zonal persistent disks so you can add and resize your disks without handling striping or redundancy. Either attach one large secondary disk and resize it as you require additional space, or attach multiple smaller disks to separate your data into multiple volumes. Unless you create a disk from an image, your new zonal persistent disks start with no data or file systems. You must format those disks yourself after you attach them to your instances. If either zonal standard persistent disks or zonal SSD persistent disks do not meet all of your performance or flexibility requirements, you can add additional storage options to your instances. Every persistent disk you create has a default physical block size of 4 KB. If your database application requires an increased physical block size, you can select 16 KB when creating your disk. This feature is not supported for boot disks. If you want to change the size of an existing disk's physical block, you must snapshot the disk, then create a new disk. You cannot directly edit the physical block size of a persistent disk. Read about the difference between different types of persistent disks. Create a zonal standard persistent disk or a zonal SSD persistent disk and attach it to an existing instance. If you do not have any instances, you must first create and start a new instance. During instance creation you can attach up to 15 secondary non-boot zonal persistent disks to store your applications, data files, databases, and logs on separate volumes. Create and attach a zonal persistent disk through the Google Cloud Platform Console, the gcloud tool, or the API. Click the name of the instance where you want to add a disk. Under Additional disks, click Add item. In the Name drop-down menu, click Create disk. Specify a name for the disk, configure the disk's properties and specify disk's Source type. Optionally, you can select your Physical block size (KB). The disk default size is 4 KB. However, you can select 16 KB from the drop-down menu to increase the physical block size of the disk. At the bottom of the instance details page, click Save to apply your changes to the instance and attach the new disk. Use the gcloud beta compute disks create command to create a new zonal persistent disk. If you need a zonal SSD persistent disk for additional throughput or IOPS, include the --type flag and specify pd-ssd. Optionally, add the --physical-block-size flag to set the physical block size. [BLOCK_SIZE] is either 4096 (4 KB) or 16384 (16 KB). 4 KB is the default physical block size. 16 KB is the increased physical block size. [INSTANCE_NAME] is the name of the instance where you are adding the new zonal persistent disk. Use the gcloud beta compute disks describe command to see a description of your disk. The response includes the disk's physical block size. In the API, construct a POST request to create a zonal persistent disk using the disks.insert method. Include the name, sizeGb, and type properties. Since this is a blank data disk, you must include the sourceImage property. Optionally, include the physicalBlockSizeBytes property to set the physical block size. New zonal persistent disks start with no data or file systems. You must format those disks yourself after you attach them to your instances. The formatting process is different on Linux instances and Windows instances. If you are connecting to a VM instance that can run as a service account, you must also grant the roles/iam.serviceAccountUser role. Format and mount the new disk on your Linux instance. You can use any partition format and configuration that you need, but it is easiest to create a single ext4 file system without a partition table. This makes it simple to resize your disk later if you need more storage space. Click the SSH button next to the instance that has the new attached disk. The browser opens a terminal connection to the instance. In the terminal, use the lsblk command to list the disks that are attached to your instance and find the disk that you want to format and mount. In this example, sdb is the device ID for the new zonal persistent disk. Format the disk. You can use any file format that you need, but the most simple method is to format the entire disk with a single ext4 file system and no partition table. If you resize the zonal persistent disk later, you can resize the file system without having to modify disk partitions. Format the disk using the mkfs tool. This command deletes all data from the specified disk, so make sure that you specify the disk device correctly. To maximize disk performance, use the recommended formatting options in the -E flag. It is not necessary to reserve space for root on this secondary disk, so specify -m 0 to use all of the available disk space. where [DEVICE_ID] is the device ID of the zonal persistent disk that you are formatting. For this example, specify sdb to format the entire disk with no partition table. Note: RHEL 6 and CentOS 6 do not accept the lazy_journal_init=0 argument. Remove this parameter when formatting zonal persistent disks on instances with these images. Create a directory that serves as the mount point for the new disk. You can use any directory that you like, but this example creates a new directory under /mnt/disks/. where: [MNT_DIR] is the directory where you will mount your zonal persistent disk. [DEVICE_ID] is the device ID of the zonal persistent disk that you are mounting. [MNT_DIR] is the directory where you will mount your zonal persistent disk. Configure read and write permissions on the device. For this example, grant write access to the device for all users. where: [MNT_DIR] is the directory where you mounted your zonal persistent disk. Optionally, you can add the zonal persistent disk to the /etc/fstab file so that the device automatically mounts again when the instance restarts. Create a backup of your current /etc/fstab file. Use the blkid command to find the UUID for the zonal persistent disk. The system generates this UUID when you format the disk. Use UUIDs to mount zonal persistent disks because UUIDs do not change when you move disks between systems. [DEVICE_ID] is the device ID of the zonal persistent disk that you want to automatically mount. If you created a partition table on the disk, specify the partition that you want to mount. [UUID_VALUE] is the UUID of the zonal persistent disk that you must include in the /etc/fstab file. [MNT_DIR] is the directory where you mounted your zonal persistent disk. [NOFAIL_OPTION] is a variable that specifies what the operating system should do if it cannot mount the zonal persistent disk at boot time. To allow the system to continue booting even when it cannot mount the zonal persistent disk, specify this option. For most distributions, specify the nofail option. For Ubuntu 12.04 or Ubuntu 14.04, specify the nobootwait option. Optionally, you can complete this step with a single command. For example, the following command creates an entry in /etc/fstab to mount the /dev/sdb zonal persistent disk at /mnt/disks/disk-1 using its UUID. If you detach this zonal persistent disk or create a snapshot from the boot disk for this instance, edit the /etc/fstab file and remove the entry for this zonal persistent disk. Even with the nofail or nobootwait options in place, keep the /etc/fstab file in sync with the devices that are attached to your instance and remove these entries before you create your boot disk snapshot or when you detach zonal persistent disks. Note: On Container-Optimized OS, modifications to /etc/fstab do not persist across system reboots. To ensure the device is checked and mounted during boot, run the fsck and mount operations on the zonal persistent disk from your cloud-config's bootcmd section. See Mounting and formatting disks in the Container-Optimized OS documentation. Use the Windows Disk Management tool to format and mount the new disk on a Windows instance. Click the RDP button next to the instance that has the resized disk. The browser opens an RDP connection to the instance. If you have not initialized the zonal persistent disk before, the tool prompts you to select a partitioning scheme for the new disk. 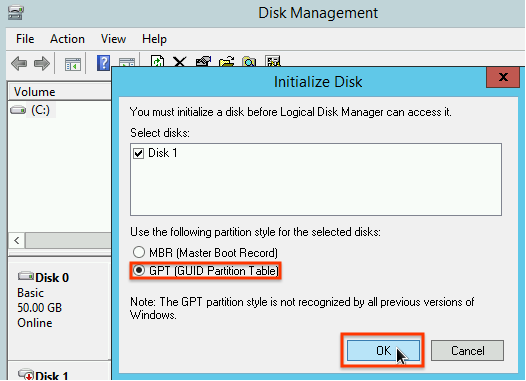 Select GPT and click OK.
After the disk initializes, right click the unallocated disk space and select New Simple Volume. Follow the instructions in the New Simple Volume Wizard to configure the new volume. 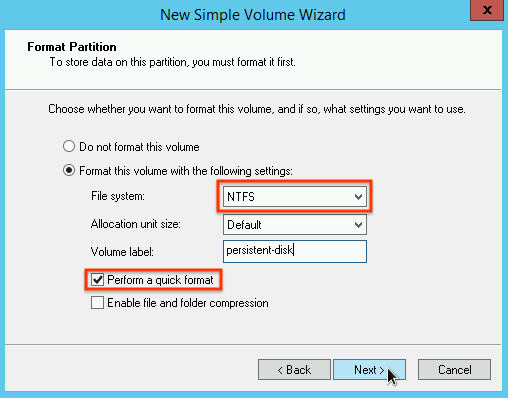 You can use any partition format that you like, but for this example select NTFS. Also, check Perform a quick format to speed up the formatting process. Optionally, set the cluster size in the Allocation unit size field. The cluster size limits the maximum size of the partition. If you try to resize the zonal persistent disk and this partition later. After you complete the wizard and the volume finishes formatting, check the Status column on the list of attached disks to ensure that the new disk has a Healthy status. You can now write files to the zonal persistent disk. You can resize zonal persistent disks when your instances require more storage space, and attach multiple secondary disks only when you need to separate your data into unique partitions. Note: Boot disks use MBR partitions, which are limited to 2 TB in size. Do not resize boot disks beyond 2 TB. You can resize disks at any time, regardless of whether the disk is attached to a running instance. Go to the Disks page to see a list of zonal persistent disks in your project. Click the name of the disk that you want to resize. At the top of the disk details page, click Edit. In the Size field, enter the new size for your disk. Boot disks and secondary disks with MBR partition tables can resize only up to 2 TB. At the bottom of the disk details page, click Save to apply your changes to the disk. In the gcloud tool, use the disks resize command and specify the --size flag with the desired disk size in GB. [DISK_SIZE] is the new size for the disk in GB. Boot disks and secondary disks with MBR partition tables can resize only up to 2 TB. In the API, construct a POST request to the compute.disks.resize method. In the request body, specify the sizeGb parameter and set it to the desired disk size in GB. After you resize your zonal persistent disk, you must configure the file system on the disk to use the additional disk space. If the disk has a partition table, such as a boot disk, you must grow the partition and resize the file system on that partition. If your zonal persistent disk has only a file system and no partition table, you can just resize the file system. Alternatively, instances that use most recent versions of Public Images can automatically resize their partitions and file systems after a system reboot. The SUSE Linux Enterprise Server (SLES) public images are the only images that do not support this feature. Before you modify the file system on your zonal persistent disk, create a snapshot. On Linux instances, connect to your instance and manually resize your partitions and file systems to use the additional disk space that you added. This manual process does not require you to restart the instance. Identify the disk with the file system and the partition that you want to resize. If your disk is already mounted, you can use the df command and the lsblk commands to compare the size of the file system and find the disk ID. In this example, the /dev/sda1 partition is on a resized 20 GB boot disk, but the partition table and the file system provide only 9.7 GB to the operating system. Additionally, the /dev/sdb secondary disk has no partition table, but the file system on that disk provides only 250 GB to the operating system. In this example, the df command shows that the /dev/sda1 partition is mounted as the root file system, and the /dev/sdb disk is mounted as a secondary disk at /mnt/disks/disk-1. If the disk has no partition table, and simply has a file system written to the disk, you can skip the 'growpart' step. If the disk that you want to resize has a partition table, you must grow the partition before you resize the file system. Use growpart to resize your image partition. Not all images include growpart in their utilities, so you might need to install it. where [DEVICE_ID] is the device ID, and [PARTITION_NUMBER] is the partition number for that device. For example, sudo growpart /dev/sdb 1. Notice that, in this case, there is a space between the device ID and the partition number. Extend the file system on the disk or the partition to use the added space. If you grew a partition on your disk, specify the partition. If your disk does not have a partition table, specify only the disk ID. where [DEVICE_ID] is the device ID and [PARTITION_NUMBER] is the partition number for the device where you are resizing the file system. For example, /dev/sdb points to a disk, and /dev/sdb1 points to the first partition on that disk. Optionally, use the df command to verify that the file system is resized. where [DEVICE_ID] is the device ID for the disk where you want to view the file system configuration. Use the Windows Disk Management tool to resize partitions on a Windows instance. 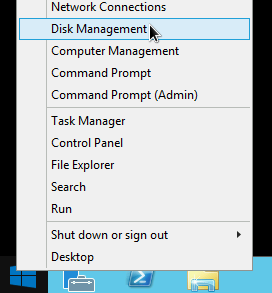 Right click the Windows Start button and select Disk Management to open the Disk Management tool. Refresh the Disk Management tool so that it recognizes the additional space on your zonal persistent disk. At the top of the Disk Management window, click Action and select Refresh. On the disk that you resized, right-click on the formatted partition and select Extend Volume. Follow the instructions in the Extend Volume Wizard to extend your existing partition to include the extra disk space. If the existing partition is formatted in NTFS, the maximum partition size is limited by its cluster size settings. You can now use the extra zonal persistent disk space to store data. Read-write zonal persistent disks can be automatically deleted when the associated virtual machine instance is deleted. This behavior is controlled by the autoDelete property on the virtual machine instance for a given attached zonal persistent disk and can be updated at any time. Similarly, you can also prevent a zonal persistent disk from being deleted as well by marking the autoDelete value as false. Note: You can only set the auto-delete state of a zonal persistent disk attached in read-write mode. On the VM Instances page, select the instance from which you want to detach the disk. Under Boot disks and local disks, check to see if the Delete boot disk when instance is deleted option is selected. If you want to unselect it, click the Edit button at the top of the page. You can attach a non-boot zonal persistent disk to more than one virtual machine instance in read-only mode, which allows you to share static data between multiple instances. Sharing static data between multiple instances from one zonal persistent disk is cheaper than replicating your data to unique disks for individual instances. If you have a zonal persistent disk with data that you want to share between multiple instances, detach it from any read-write instances and attach it to one or more instances in read-only mode. Note: You can only share zonal persistent disks with instances in the same zone as the disk. Go to the Instances page to see the list of instances in your project. In the Name column, click the name of the instance where you want to attach the disk. The instance details page opens. In the Additional disks section, click Add item to add a disk item to the list of attached non-boot zonal persistent disks. In the Name column, click Select a disk and click the name of the disk that you want to attach. If you create a new non-boot disk, configure the properties for it, and click Create to apply the changes. In the Mode column, click Read/write and change it to Read only. Connect to the instance and mount the disk. Repeat this process to add the disk to other instances in read-only mode. In the gcloud tool, use the compute instances attach-disk command and specify the --mode flag with the ro option. [INSTANCE_NAME] is the name of the instance where you want to attach the zonal persistent disk. [DISK_NAME] is the name of the disk that you want to attach. After you attach the disk, connect to the instance and mount the disk. Repeat this command for each instance where you want to add this disk in read-only mode. In the API, construct a POST request to the compute.instances.attachDisk method. In the request body, specify the mode parameter as READ_ONLY. [DISK_NAME] is the name of the disk that you are attaching. Repeat this request for each instance where you want to add this disk in read-only mode. Create a snapshot of a persistent disk. Create an instance with local SSDs. Connect your instance to a Cloud Storage bucket. Mount a RAM disk on your instance.